My son loves soup and has been asking me to make it for him. Most of the soups I make are in the fall and winter, and wouldn’t work for a hot summer night. I found this recipe for a light and brothy soup – perfect for summer! It’s a full of delicious fresh veggies and homemade pesto. It was delicious and we all loved it! You can easily swap out some of the veggies for what you have on hand or prefer, but we loved it packed full of green vegetables. I’m working on getting back to blogging regularly now that the spring sports season is coming to an end. There were only a few days in all of April and May that we didn’t have something going on which led me to make quick and easy dinners to get us to practices or games. I’m looking forward to getting back in the kitchen and unwinding with a little baking and cooking. I threw together this quick pasta dish on Monday night – we’re back to Meatless Mondays – and it was so simple and delicious! I think sometimes the most simple meals are what is needed every now and then. I used a new type of pasta – Casarecce. It’s a short, wide strip of pasta that is loosely rolled like a scroll and twisted. It as perfect for holding all space and pieces of garlic. I can’t wait to use it again with fresh pesto this summer! Evenings have been a little crazy around our house the past couple of weeks, so I’m always looking for ways to get dinner on the table quickly. This recipe definitely did that…except I was the only one who enjoyed it. Everyone else in my family was just blah on it. Oh well, you can’t always please everyone 🙂 I still wanted to share it with you all! I liked the hint of barbecue sauce with the shredded chicken. I served it with a green salad and dinner was ready in no time at all. I’ve been in a bit of a food rut lately and haven’t been making many new recipes. 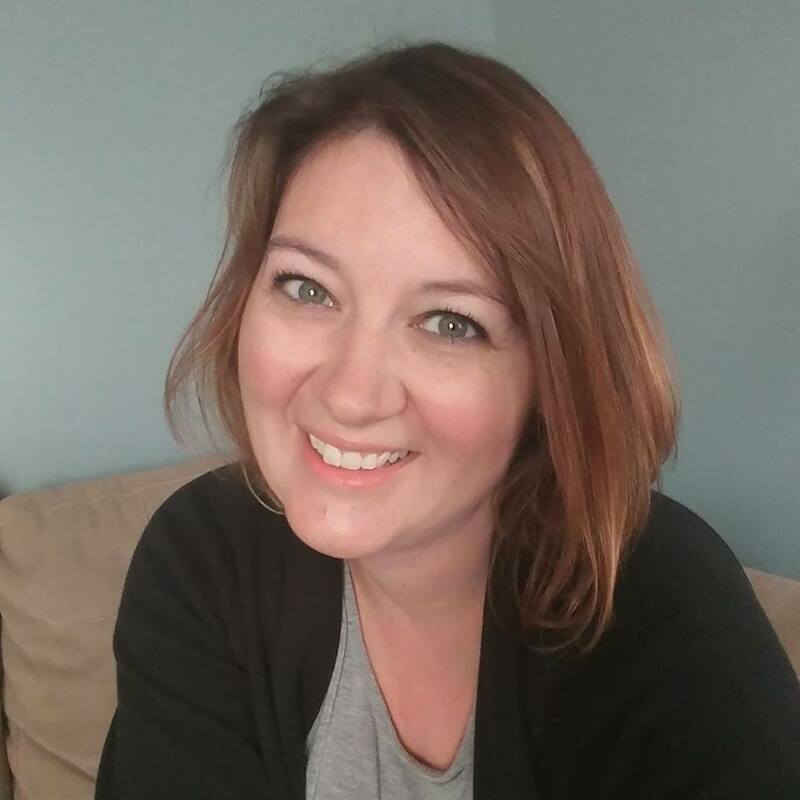 I’m hoping I can get out of this funk soon and get back to blogging regularly. Part of the problem is that I’ve been working to clean out of our freezer and pantry, so there’s not been too many exciting meals that I wanted to shared. My kids are also going through a picky stage and sometimes it’s not worth the battle to make something where one or more of us ends in tears. One meal that we usually can agree on is meatballs. I had a pack of ground turkey in the freezer and there’s always pasta and sauce in the pantry. 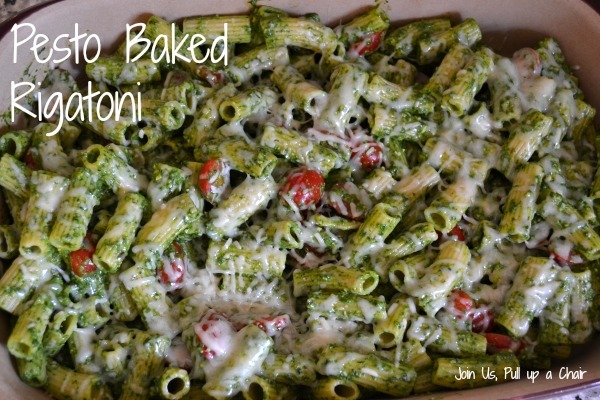 This was a great recipe to use up some of the items I had in the refrigerator too – spinach and basil! These meatballs were really easy to make, plus I loved that they were baked and not pan fried. Everyone agreed and gobbled dinner up! Preheat oven to 400 degrees. In the bowl of a food processor, combined the spinach, herbs, garlic, salt and pepper. Pulse until the mixture is finely chopped and set aside. In a large bowl, mix together the ground turkey and egg. Fold in the spinach herb mixture, breadcrumbs and Parmesan cheese. Form golf sized meatballs and place on a baking sheet. In a small bowl, mix together the 2 tablespoons of marinara sauce and olive oil. Baste the meatballs with this sauce. Bake for 15 to 20 minutes or until the meatballs are cooked through and golden brown. Toss with warmed marinara sauce and serve with your favorite type of pasta. It’s been quiet around here and we’ve really enjoyed getting a chance to relax. This week is Thanksgiving and I’m so thankful to have a few days to recharge and get ready for a busy holiday season. We have some fun activities coming up and planning to take full advantage of all the amazing events that our community holds from Santa to train rides and everything in between. I bought a pack of gorgeous heirloom tomatoes at Costco recently and knew I had to make something with them! When I was working on my weekly menu, I came across this recipe on Pinterest. It looked amazing and would be a perfect way to highlight those tomatoes. It’s a quick and easy meal to make for busy weeknights too! In a large skillet, heat 1 tablespoon of butter and olive oil over medium-high heat. Add the shrimp and half of the minced garlic. Season with the paprika and salt and saute for 1 minute or until the cooked side of shrimp is pink. Flip the shrimp over and cook for an additional minute or two. Transfer the shrimp to a plate. Add in another tablespoon of oil if needed and saute the spinach, tomatoes and remaining garlic until cooked. Remove from heat and add in the shrimp. While the shrimp is cooking, start cooking your pasta according to the package. When the pasta is cooked to your likeness, add it directly to the skillet with the cooked shrimp. Place an additional 1 to 2 tablespoons of butter on top and a squeeze the lemon over the pasta. Add a little pasta water if you need to thin out the sauce. Place the skillet back on the stove to make sure the shrimp are fully cooked and the entire dish is heated through. Lately I’ve noticed both of my kids are rejecting vegetables. I’m not sure what happened, they used to be so good about eating salads and now the mention sends them into a tizzy. So needless to say, I’ve been looking for ways to incorporate more vegetables into our meals without them being as noticeable. This dish was a huge hit! Cooper gobbled it and up and asked for seconds! 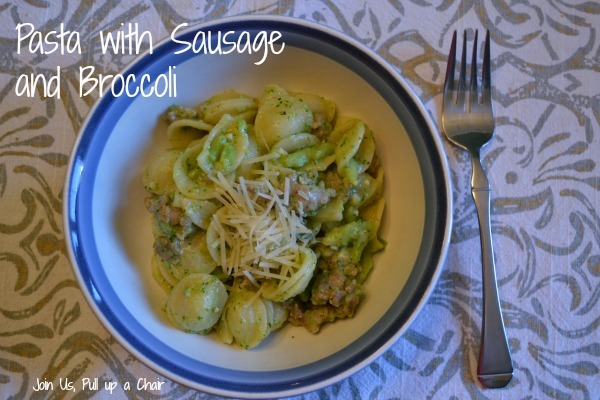 It was a quick and easy meal, especially since the broccoli and pasta are cooked in one pot. In a large skillet, cook the sausage over medium-high heat, breaking it up as it cooks. Drain fat and remove from the heat. While the sausage is cooking, begin to bring a large pot of water to boil. Once the water is boiling, cook the pasta to al dente and add in the broccoli florets. Reserve one cup of pasta water and set aside before draining. Return the pot to the stove and add in 1 tablespoon of olive oil. Add in the garlic and saute until golden and then reduce the heat to low. Add the pasta and broccoli to the pot along with the cooked sausage. Mix well and add in the remaining tablespoon of olive oil, Parmesan cheese and season with salt and pepper. Add 1/2 cup of the reserved pasta water to create a thin sauce and add any additional water as needed. Serve in bowls and top with additional Parmesan cheese if desired. Well it’s been a crazy week! I had all intentions to get caught up on recipes this week, but sometimes life throws you for a loop and everything goes out the window. My little guy started to get sick on Thursday night and I thought he was improving, but we ended up making a midnight trip to the ER on Sunday night. It was a whirlwind of 36 hours spent being observed in the peds floor for dehydration. He was released on Tuesday afternoon and is doing much better. Then my daughter got sick…. Luckily it was short-lived and she’s already better. Now onto the recipe…pesto baked rigatoni. I loved this pesto especially since it’s a combination of spinach and kale. Both the kids loved it and it was quick and easy to make. It would be great to take to a potluck or a meal for new parents. Preheat oven to 400 degrees. In a food processor, add in all the pesto ingredients and puree until smooth. In a large stock, bring water to boil and cook the pasta according to the package instructions. Slice the tomatoes in half and place in a large bowl. Add in the pesto and the cooked pasta. Add in half of the reserved pasta water and mix until it’s well combined. Add more water if necessary to make it saucy. Pour into a 9×13 baking dish and top with the mozzarella cheese. Cover loosely with aluminum foil and bake for 10-15 minutes until the cheese has melted and the dish is warmed through.